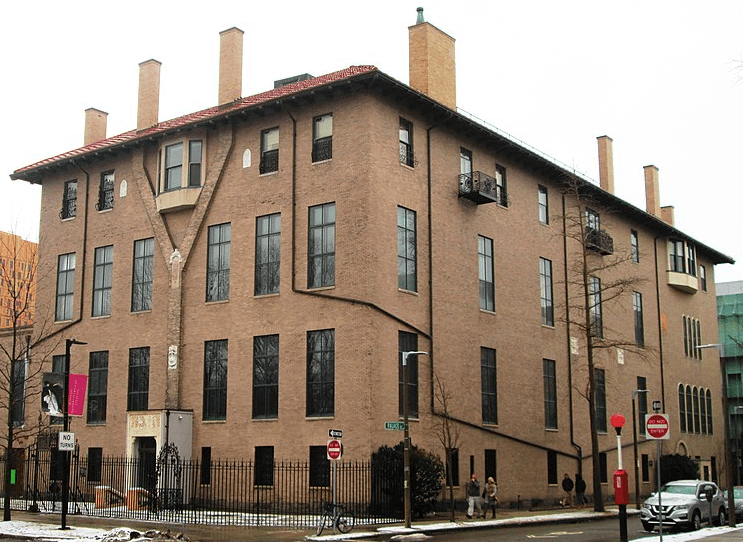 Photo: the original building of the Isabella Stewart Gardner Museum, called “Fenway Court” when Gardner was alive. It is one of the two buildings of the museum. Located on the Fenway in Boston, Massachusetts, it was built in 1902 and was designed by Willard T. Sears. Credit: Beyond My Ken; Wikimedia Commons. Isabella Stewart Gardner, the wealthy Bostonian who established the museum in 1903 to showcase her dazzling private art collection and carefully watched over it until her death in 1924, would surely be heartbroken at the loss of some of her most precious treasures. Among the paintings stolen was one by Vermeer (one of only 34 paintings by the Dutch master known to exist), and other masterpieces by such artists as Degas, Manet and Rembrandt. It is impossible to accurately gauge the value of the artworks, since none of them has been on the open market for over a century, but estimates have ranged as high as $500 million. Despite offers of complete confidentiality and a $10 million reward, no one has come forward to provide any information to the museum. As one of the following three newspaper articles speculates, it is quite likely the art works have disappeared into the underworld art market and may never be recovered. BOSTON – Thieves disguised as policemen talked their way into a leading art museum yesterday and stole 11 paintings, including major works by Rembrandt, Degas, Manet and Vermeer, FBI and museum officials said. The value of the missing works, which also included an ancient Chinese beaker, was “in the hundreds of millions of dollars,” said Karen Haas, acting curator of the Isabella Stewart Gardner Museum. The paintings’ value cannot be accurately determined because they have not been on the market for nearly a century, she said. In any case, art experts said, such well-known works could not be sold on the open market. “It is the biggest old master theft in this country, by far,” said Constance Lowenthal, executive director of the International Foundation for Art Research in New York, which tracks stolen artworks. Around 1 a.m. yesterday, the thieves apparently convinced museum guards they were police officers and tied them with tape before making their way to the museum’s Dutch room, Cavanagh said. The guards were not hurt, he said. “This is one of those thefts where people actually spent some time researching and took specific things,” Cavanagh said. The investigation would not be limited to the United States, he said. The works taken were: “The Concert” by Jan Vermeer; “A Lady and a Gentleman in Black,” “The Storm on the Sea of Galilee,” and a self-portrait by Rembrandt; “Landscape with an Obelisk” by Govaert Flinck, another 17th-century Dutchman; “La Sortie du Pesage,” “Cortege aux Environs de Florence,” “Three Mounted Jockeys,” “Program for an Artistic Soiree,” and another, less complete work by the same name, by Edgar Degas; “Chez Tortoni” by Edouard Manet; and a Chinese bronze beaker dating from the Shang Dynasty, 1,200-1,100 B.C. William Robinson, curator of drawings for Harvard University’s Fogg Art Museum, called the objects stolen “major works.” Robinson said the Rembrandt self-portrait and “The Storm on the Sea of Galilee,” the artist’s only seascape, were especially important. Corey Cronin, a museum spokesman, said the works were part of the museum’s permanent collection dating from the last century. Cronin said the museum had a “state of the art” security system and employed two security guards. He said no apparent damage was done to the museum, a former mansion built at the turn of the century in the style of a 15th century Venetian palace. 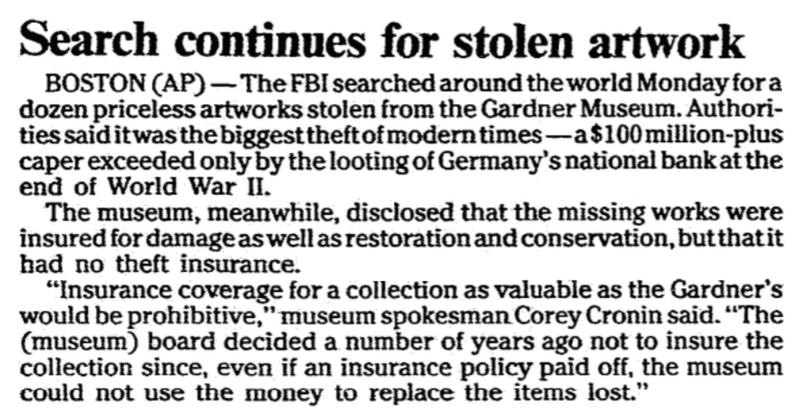 BOSTON (AP) – The FBI searched around the world Monday for a dozen priceless artworks stolen from the Gardner Museum. Authorities said it was the biggest theft of modern times – a $100 million-plus caper exceeded only by the looting of Germany’s national bank at the end of World War II. The museum, meanwhile, disclosed that the missing works were insured for damage as well as restoration and conservation, but that it had no theft insurance. BOSTON (AP) – Occasionally, an art theft reads like the plot from an Ian Fleming thriller in which half-mad billionaires pay slick international thieves to steal famous paintings for their private pleasure. In reality, experts said yesterday, most art is stolen to earn a quick buck in an international black market that is second in size only to the drug trade. The priceless art stolen Sunday from the Isabella Stewart Gardner Museum is too notorious to be sold anywhere, raising the specter that the pieces could be held hostage for ransom for a fraction of the hundreds of millions of dollars the art world says the paintings are worth. The true scale of the art underworld is difficult to gauge, but investigators say art thievery is increasing as prices for works on the legal market soar. Rarely, one end of the market is held up by someone who decides to commission the theft of a painting that cannot be legitimately acquired. One such theft occurred in 1983, when thieves stole Italian Renaissance masterpieces, including Raphael’s self-portrait, from the Hungarian national museum in Budapest. Investigators found that a sophisticated band of Italian art thieves, armed with cutting tools and high-tech alarm-busting devices, executed a perfect break-in and vanished with the works. An extensive dragnet eventually snared the thieves in their home country before they could get the paintings to Greece where, it was later found, an olive oil baron had paid a handsome sum for the sake of having the works hang in his home. 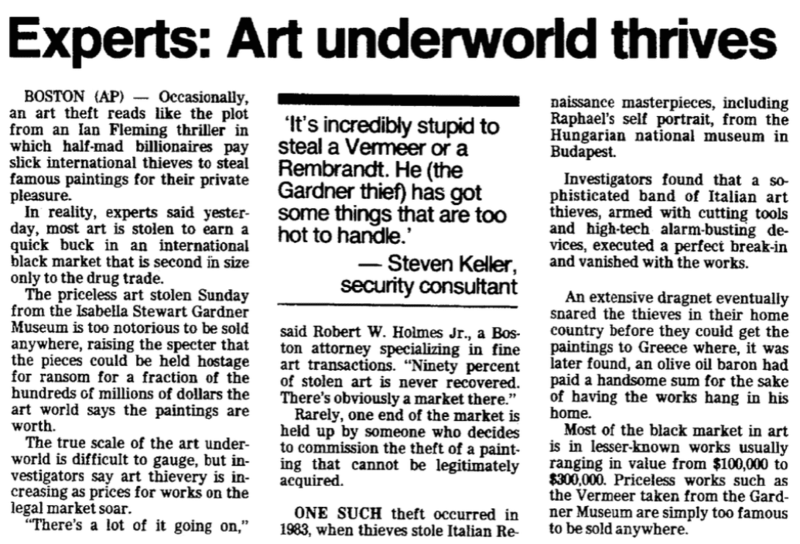 Most of the black market in art is in lesser-known works usually ranging in value from $100,000 to $300,000. Priceless works such as the Vermeer taken from the Gardner Museum are simply too famous to be sold anywhere. Note: An online collection of newspapers, such as GenealogyBank’s Historical Newspaper Archives, is not only a great way to learn about the lives of your ancestors – the old newspaper articles also help you understand American history and the times your ancestors lived in, and the news they talked about and read in their local papers – as well as more recent events.